Ion-Containing Polymers: Physical Properties and Structure is Volume 2 of the series Polymer Physics. 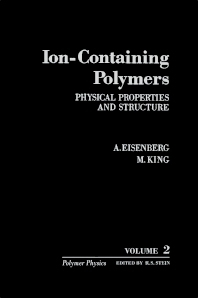 This book aims to fill in the gap in literature regarding the physical aspects of ion-containing polymers. A total of five chapters comprise this book. The Introduction (Chapter 1) generally deals with the application of ion-containing polymers, general classification, and the available works regarding the subject. Chapter 2 establishes the concepts of supermolecular structure and glass transitions in terms of the effects of ionic forces in polymers. These chapters provide the context in the discussion of viscoelastic properties of homopolymers and copolymers in Chapters 3 and 4. Finally, Chapter 5 tackles the configuration-dependent properties of ion-containing polymers. This volume will be of particular help to students in the field of physics and chemistry.